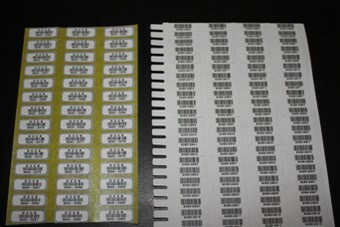 With DCCS you have the option of Pre-Printed or Computer Generated Heat Seal Bar Codes. Heat Seals are the fastest and most economical way to integrate to Industry sorting conveyors and Computer Assisted Assembly systems. Today’s size of Preprinted heat seals (.6875” x .25) allows for attachment to all pieces. DCCS now offers two types of preprinted Bar Code Heat Seals labels to permanently mark garments, Premium and Standard.